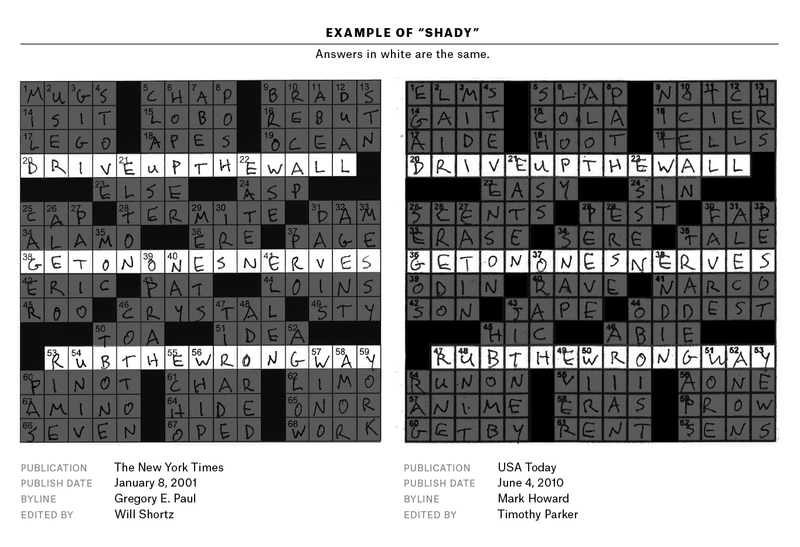 A group of eagle-eyed puzzlers, using digital tools, has uncovered a pattern of copying in the professional crossword-puzzle world that has led to accusations of plagiarism and false identity. Since 1999, Timothy Parker, editor of one of the nation’s most widely syndicated crosswords, has edited more than 60 individual puzzles that copy elements from New York Times puzzles, often with pseudonyms for bylines, a new database has helped reveal. The puzzles in question repeated themes, answers, grids and clues from Times puzzles published years earlier. Hundreds more of the puzzles edited by Parker are nearly verbatim copies of previous puzzles that Parker also edited. Most of those have been republished under fake author names. Nearly all this replication was found in two crosswords series edited by Parker: the USA Today Crossword and the syndicated Universal Crossword. 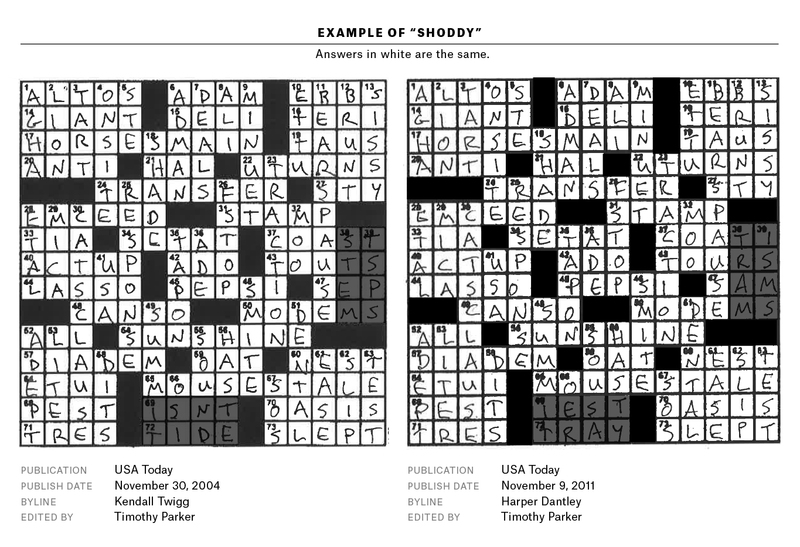 (The copyright to both puzzles is held by Universal Uclick, which grew out of the former Universal Press Syndicate and calls itself “the leading distributor of daily puzzle and word games.”) USA Today is one of the country’s highest-circulation newspapers, and the Universal Crossword is syndicated to hundreds of newspapers and websites. On Friday, a publicity coordinator for Universal Uclick, Julie Halper, said the company declined to comment on the allegations. FiveThirtyEight reached out to USA Today for comment several times but received no response. UPDATE (March 7, 6:08 p.m.): Since the publication of this article, Universal Uclick and USA Today have each said that Timothy Parker will be stepping back from his role creating puzzles for the two publishers while an investigation is conducted. You can read their full statements here. When I spoke with Parker on Thursday, he didn’t deny that many of his puzzles exactly replicated themes and theme answers from Times puzzles. “To me, it’s just mere coincidence,” he said. He did deny that themes were purposefully replicated with his knowledge and claimed that he hadn’t looked at a New York Times crossword in years. “We don’t look at anybody else’s puzzles or really care about anyone else’s puzzles,” Parker said. 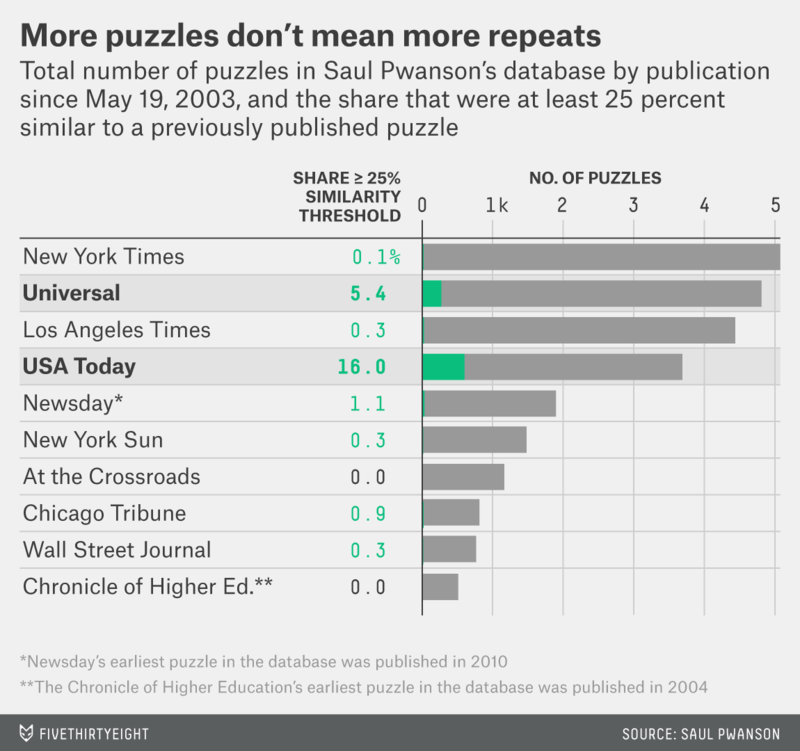 Despite Parker’s denial, many in the crossword world see willful plagiarism in Parker’s puzzles, and they see the database that revealed the repetition as a tool of justice. “It’s like a murder mystery solved 50 years later with DNA evidence,” Matt Gaffney, a professional crossword constructor, told me. The theme: A crossword puzzle’s identity — it’s why a puzzle is memorable, or clever, or creative, or funny, and it’s the toughest part to execute when constructing a puzzle. The theme answers are usually the longest answers in the grid and are tied together by some clever conceit. The fill: The rest of the answers in the puzzle. Computers nowadays can aid in finding suitable fill. 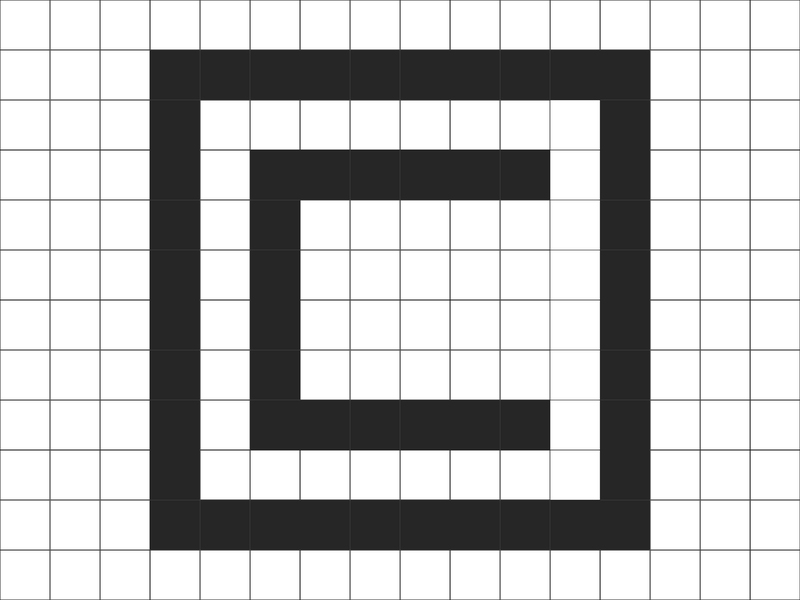 The grid: The series of white and black squares — the scaffolding onto which the puzzle is built. The clues: The things the solver reads, and ponders, before scribbling answers into the grid. Crosswords are ripe with repetitions in the fill — “ERA,” for example, has been used 480 times in the last 23 years of New York Times crossword puzzles. But those smaller words are just mortar — they aren’t the bricks that puzzle designers spend all their time baking. Original themes, unique grids, fresh fill and clever clues are the currency of construction. There’s no rule book or official code of ethics in the urbane world of crossword puzzle construction, but it’s generally understood that copying a puzzle’s theme — using the exact clues and exact answers as another puzzle — infringes upon the original work of a puzzle constructor. “The animating impulse of crosswords is, ‘How can I do something new in this medium?’” said Ben Tausig, editor of the American Values Club crossword. Crossword themes can be replicated, or close to it, by chance. In 2009, Gaffney wrote about one such instance in which he nearly identically replicated a theme of another creator, without having any prior knowledge that the other puzzle existed. But even in that case, one theme answer was different, as was the grid. Something different seems to be going on with Parker’s puzzles. The database that helped uncover the repetition holds tens of thousands of puzzles published by 11 outlets over various time periods — for example, it holds puzzles from The New York Times starting in 1942 and from the Los Angeles Times starting in 1996. The engineer who created the database also wrote a computer program that identifies similar puzzles and assigns each pair of similar puzzles a similarity score, essentially the percentage of letters and black squares that are shared by two puzzles’ grids. To confirm the database was accurate, I went to the library and pulled spool after spool of microfilm. Sure enough, there were the replications in black and white. More broadly, 1,090 Universal puzzles and 447 USA Today puzzles were at least a 75 percent match to an earlier puzzle in the database. (Sometimes the match is with a puzzle from the same publication.) That’s 16 percent of all the Universal puzzles in the database (about one out of every six) and 8 percent of all the USA Today puzzles (one out of every 12). There are two types of Parker’s puzzle duplications that the database has laid bare: what I’m calling the “shady” and the “shoddy.” The shady are puzzles that appeared in Universal or USA Today with themes and theme answers identical to puzzles published earlier and in separate, unrelated publications, most often The New York Times and occasionally the Los Angeles Times and Chicago Tribune. In every such case I saw — roughly 100 cases — the theme answers were in identical locations within the grid, and in many cases, the later puzzle also replicated the earlier puzzle’s grid and some of its clues. It’s not alone. “Breakfast combo,” “lunch combo” and “dinner combo” were all clues to theme answers in both a 2001 Los Angeles Times puzzle and a 2006 Universal puzzle. The answers — “COFFEEANDDANISH,” “SOUPANDSANDWICH” and “MEATANDPOTATOES” — were the same in both, again with the same placement. The last 23 years of New York Times crosswords are available online for an annual fee of $39.95. The other category of suspicious duplication — the “shoddy” — are puzzles that were published in USA Today or Universal and reappeared later — often with identical theme, grids and fill, or with extremely minor changes — in either USA Today or Universal. (The USA Today puzzle is copyrighted to Universal Uclick, but the two puzzles are meant to be distinct.) In the vast majority of these cases, the two puzzles are published with different authors attached to them. Most of the clues for these puzzles are often identical as well. The website for the Universal Crossword says: “The original hit puzzle from Tim Parker sets the standard for all daily crosswords. Clues and themes are served up fresh daily in this classic puzzle.” But the themes are, in many cases, not fresh at all. Tausig, who has constructed puzzles for several major publications, drew the crossword world’s attention to the repetitions in a tweet on Feb. 25. Tausig told me — and I confirmed with the database –– that a puzzle he had authored for Universal in 2004 had been very slightly tweaked and rerun by Universal in 2008 — under the byline “Bruce Manders” — and then rerun again last year with Tausig’s byline back on it. Tausig discovered this with the help of the newly assembled database of crossword puzzles created by Saul Pwanson,1 a software engineer. Pwanson wrote the code that identified the similar puzzles and published a list of them on his website, along with code for the project on GitHub. The puzzle database is the result of Pwanson’s own Web-scraping of about 30,000 puzzles and the addition of a separate digital collection of puzzles that has been maintained by solver Barry Haldiman since 1999. Pwanson’s database now holds nearly 52,000 crossword puzzles, and Pwanson’s website lists all the puzzle pairs that have a similarity score of at least 25 percent. Even to avid solvers and constructors, Parker’s puzzle replication had remained largely hidden in plain sight until last month. Even though themes can often get replicated here and there, purposeful “plagiarism is virtually unheard of in the crossword community,” Gaffney said in his 2009 Slate article. But this age of innocence may be quickly coming to an end, as the news of the puzzle replications quickly spread through the crossword community on Twitter, Facebook and email threads. Parker’s duplication of 65 New York Times themes during his tenure “is a gross violation,” Tausig said. And one that is unlikely to be explained by chance. Not only did the discovery reveal many examples of themes and theme answers being lifted wholesale, but the flow of these themes is nearly always from the Times to Universal or USA Today — almost never in the other direction. (I found only one example in the database of a USA Today puzzle’s theme being replicated later in the Times.) Even if 65 puzzles were expected to be replicated by chance, the odds that they’d all go from The New York Times to Universal and almost never the other way around are minuscule. “You’re getting into one-in-a-billion territory,” Tausig said. Despite the generally aggrieved consensus in the crossword community, the legal issues surrounding crossword repetition are murky, according to two copyright lawyers I spoke with. The “shoddy” category of puzzles, those shared and re-published between Universal and USA Today and back again, are almost certainly legal, as Universal Uclick owns the copyrights to both. CORRECTION (March 10, 11:25 a.m.): An earlier version of a table in this article misstated the number of Wall Street Journal crossword puzzles since May 19, 2003, that were at least 25 percent similar to puzzles previously published in USA Today. There is one puzzle that fits that description, not two. Because of that error, the percentage of Wall Street Journal puzzles listed in an accompanying chart as meeting the 25 percent matching threshold was also incorrect. It is 0.3 percent, not 0.4 percent. Read more: A dispatch from last year’s American Crossword Puzzle Tournament. Pwanson changed his legal name from Paul Swanson.